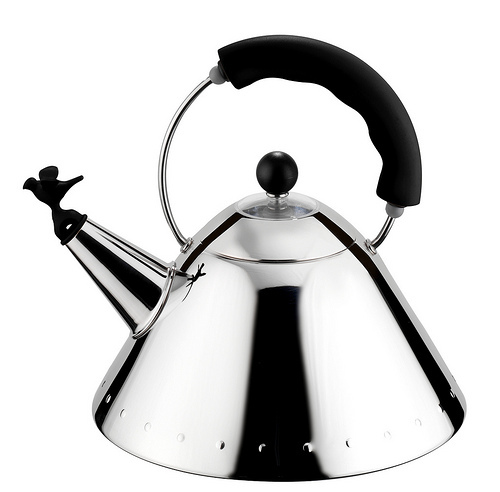 A stainless steel kettle is highly practical: It is durable, resists rust, looks attractive…so it's no surprise that kettles made of stainless steel are extremely popular! 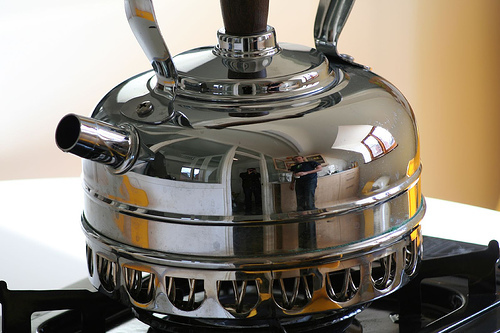 Stainless steel is widely available in both stove top and electric kettles. They can be found with or without a whistle. Copper transfers heat better than stainless steel. Having a copper at the base of the kettle, where the kettle sits on the burner, will heat the water faster. The stainless steel exterior resists dents and tarnish better than copper. 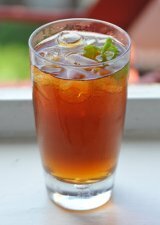 A stainless steel tea kettle with a copper bottom is the best of both worlds! Sleek, shiny, and a great-looking addition to today's kitchens. The steel luster will not clash with any colors in your decor and will match other stainless steel appliances and cookware. Long-lasting. Stainless steel is a sturdy material that resists denting, rusting, scratching, and discoloration. Easy to care for. Stainless steel wipes down nicely. Lighter than glass and cast iron. Not transparent. You can't see the water level or whether the water is boiling. Needs to be wiped down often. Fingerprints, water splashes, and other grime show up easily on the shiny stainless steel surface. While the outside of a stainless steel kettle gets smudged quickly, it is easy to clean. To maintain that shiny look, simply wipe down the outside of the kettle with a small amount of dish washing soap, warm water, and a cloth. Rinse well and towel dry to prevent spotting.